I am an English I teacher from New Orleans, Louisiana. I blog for myself, my students and for my colleagues. I am a techie junkie and I tweet often, blog sometimes, and create wikipages daily. 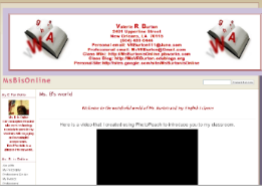 Click below to be taken to my Personal Website. There you will find out all that you wanted to know about me and what I do in class.